Doug Carney found a way to make facilities planning stress-free with an algorithm. When you hear the term “planning” does it cause a sudden burst of anxiety? Regardless of industry, face-to-face planning sessions can be tense enough to make teams over-think or perhaps under-analyze crucial concepts based on incomplete data. 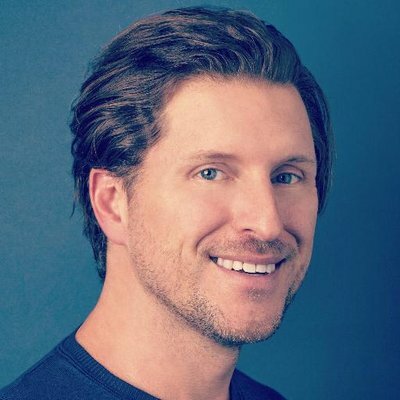 Depending on a team’s resources, data could be outdated, factually incorrect, or not thorough enough to project growth or stagnation. 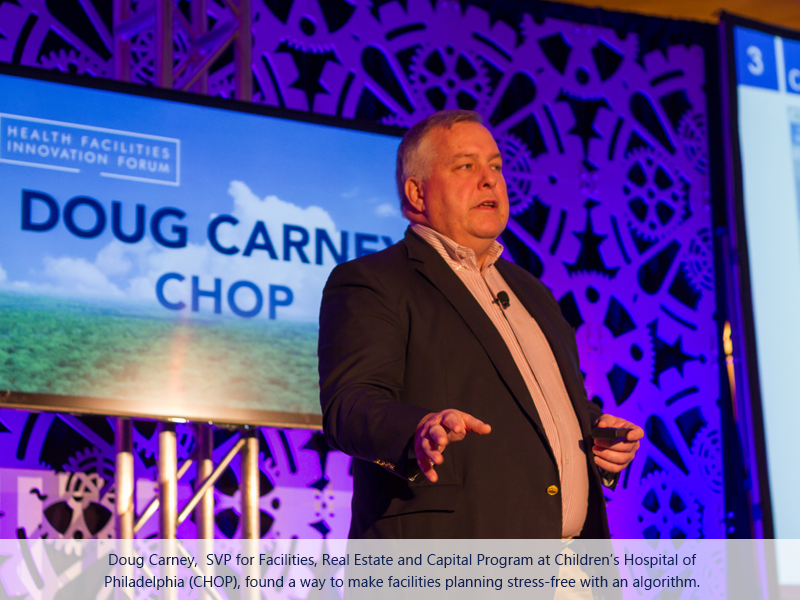 To cut down on this confusion in the realm of healthcare facilities, Doug Carney, SVP for Facilities, Real Estate and Capital Program at Children’s Hospital of Philadelphia (CHOP), found a way to make facilities planning stress-free with an algorithm. 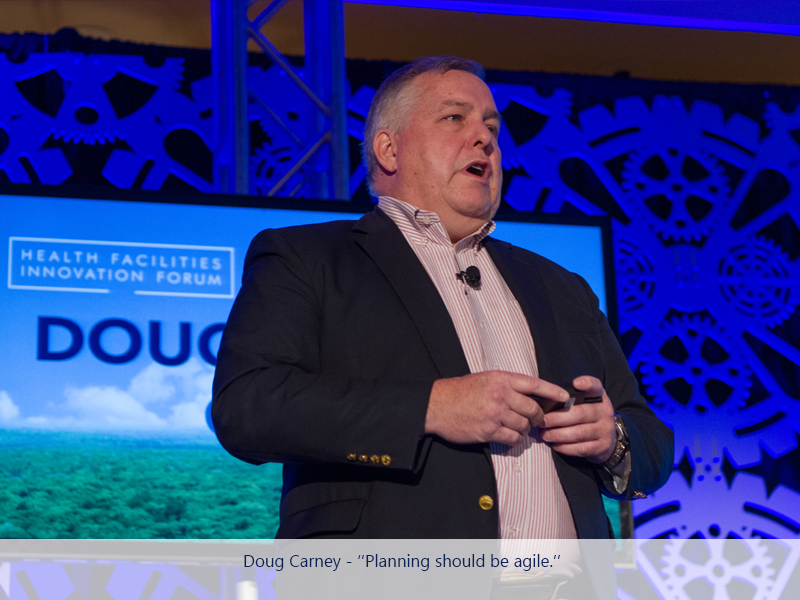 At HFIF '15, Carney gave a talk about smart, integrated planning. To kickoff the brief session, he took an informal, verbal poll of his attendees asking whom had facilities master plans (most) and then of those, current master plans (about half). Carney used those insights to setup the basis for his argument: planning should be agile. For many facilities across the US, static planning can be difficult to update and require expensive consulting. In fact, CHOP worked with seven different consulting firms over the last 20 years to create 9 master plans to the tune of almost $2 million. A solution to agile planning became clear—invest in technology. Using a proprietary planning program named C.A.S.S.andra—a tribute to the prophetic vision of Cassandra from Greek mythology—Carney demonstrated two versions of the program over the last few years. Version 1.0 provided positive and negative growth analysis over a 21-year period. Based on the collected data, Carney defined three growth drivers of high acuity inpatient spaces. Armed with data visualizations, the synthesized information created a concrete case for building a new healthcare pavilion as at least one of the bullets was proven by CASS’s statistical model. The fact that such a powerful tool could help CHOP make smart growth investments quelled any fears from the hospital’s board of directors. Fresh off a successful application, Carney’s team created version 2.0. This new iteration of CASS used 3D visual models similar to the classic late 80’s computer game, SimCity. Carney’s program showed total square foot by enterprise and department gross square footage. Above all, a built-in utilization prioritization algorithm found efficiencies. In layman’s terms, the program found the best locations for growth by defining which buildings weren’t used to their potential. Although CASS could be viewed as one of the most powerful resources at CHOP, Carney stressed that it is not a financial planning tool. He simply explained that the program uses outcome-driven simulations to find best fit based on user parameters. For instance, a facilities planner could weigh the data-driven pros and cons of expansion (or stagnation) by plugging in potential situations. Ultimately, Carney hoped to use his team’s program planning tactic as a way communicate smart project investments in the context of best-fit scenarios over time. As the session wrapped up, Carney shared the wisdom behind his multi-pronged approach to facilities planning. 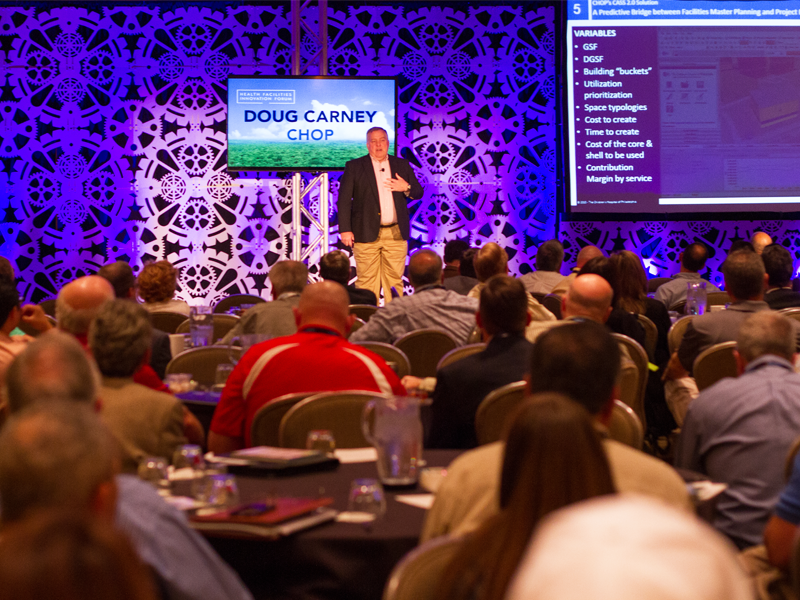 By the time Carney closed out the informative session, attendees had valuable insights, strategies and advice for planning out their resources—albeit analog for the time being. With the concept of CASS already being used, it gave hope to other types of facilities decision makers who may one day transition to solutions powered by inputs (data) and outputs (anticipated growth). Want to learn more? Watch the full video below.